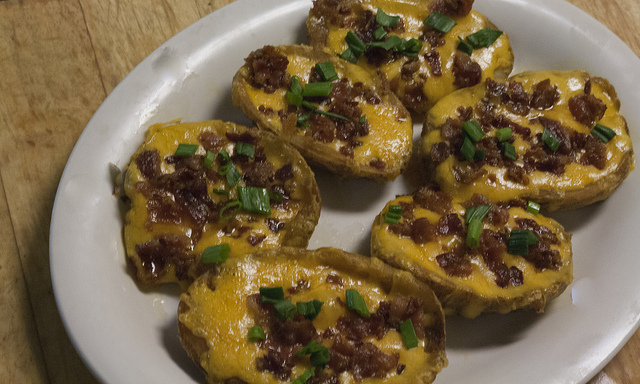 Confession: I make potato skins all the time. Great for a football game, great for a party, great for a Saturday afternoon…I could make excuses to make these all day long! You can top these potato skins any way you’d like, but I enjoy them with freshly chopped green onions (which I grow on my windowsill), chopped crispy bacon, Parmesan and a side of sour cream. Potatoes are some of the cheapest thing to buy and come in 5, 10 or 15 pound bags. Depending on how many people you’re feeding, you decide what size to get. Heat oven to 410 degrees and spray a baking sheet. Wash all potatoes and cut out any dark imperfections. Slice the potatoes in half (the long-way) and place on the baking sheet. Bake the potatoes for 45 minutes to an hour, until they are soft. While the potatoes are baking, prepare the rest of the toppings. Grate your choice or cheese and set aside in a bowl. Cook a few slices of bacon and chop into crumbles. Cut some green onion from your windowsill. Let the potatoes cool for a minute and then scoop out the insides into a bowl, leaving only the skin. Set aside the insides to make mashed potatoes later! Once you have only the potato skins, add the desired toppings and return to the oven. Bake another 10 minutes or so, until the cheese melts.